Bio: Andrea is a third-year Mathematics major at Oberlin College in Northeast Ohio. 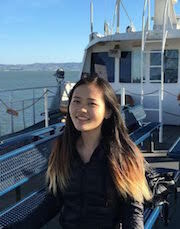 Her research interests include looking for patterns in static and temporal social networks, along with modeling energy efficiency and sustainability in urban environments. She has also collaborated on a project with SFI looking at disease propagation on human contact networks across a wealth gradient. 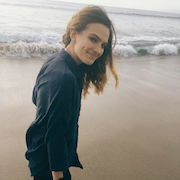 Aside from math and science, she is also passionate about practicing and teaching partner acrobatics, along with running and hiking, gardening and reading short fiction. Project Abstract: Chronology of Epidemics in Aggregated Temporal Networks - Epidemic propagation on temporal, or time-varying, social contact networks is a developing area in network science. Typical approaches involve slicing time into an arbitrary number of snapshots aggregated over an arbitrary period of time. Given the adjacency matrices A and B for two snapshots of the same underlying network, it is difficult to tell to what extent an epidemic spreading process will obey the chronology of the network if the two snapshots are aggregated into one fixed network, A+B. The solution to a system of differential equations modeling a diffusion process on the adjacency matrix for a particular network can be found using the matrix exponential. We use this method as an analogy for the epidemic spreading process on a social contact network. The product of the matrix exponential for two non-commuting matrices A and B yields an expression in terms of the aggregate A+B with a specified error term involving the commutator of the two matrices, AB-BA. We derive analytical measures to quantify the significance of the error term in the matrix exponential and explore their relationship with measures of error from simulated epidemic propagation on temporal versus aggregated versions of the network. Bio: Hi, my name is Zack Cohen. I'm a junior at University of Illinois, studying biology and physics. I'm really excited to spend the summer doing science! I'm hoping to work on modeling in biology, but I'm also eager to experience the diversity of research that goes on at SFI. Beyond that, I really love the outdoors, and so I'm also really excited to explore the nature areas around Santa Fe! Project Abstract: Energetic influence on the composition of proteins across biological size scales - A Proteins play a fundamental role in shaping form and function for all organisms. All of these specific functional properties are controlled entirely by the folding of the primary amino acid sequence. The composition of individual proteins is then certainly adapted to its unique role within the cell. By examining the global amino acid composition of all unique proteins that can be expressed in a given organism (the proteome), striking differences can be observed between life’s major domains. In 724 eukaryotic organisms, the proteome composition is on-average invariant across size scales. Meanwhile, in a diverse range of 3054 bacterial species, the composition of the proteome seems to vary as a function of organism size. Because these bacteria represent an incredible range of phylogenetic and ecological diversity, only a very general explanation of the observed shifts in proteome composition will sufficiently explain these data. Energetic constraints are always important near the small-end of life, regardless of individual-level environmental or physiological detail. Combining the observed shifts in proteome composition with existing metabolic theory, we test the hypothesis that energetic constraints bias the composition of bacterial proteomes toward more energy-efficient amino acids. We show explicitly how the metabolic energy expenditure of protein synthesis must change to produce the types of proteomes we see in modern organisms. The challenges associated with this type of study will also be discussed, as well as expansions on this metabolic framework that may be used to understand outstanding issues in primitive protein translation. Bio: Shane is a Canadian student studying at an innovative university based out of San Francisco called Minerva. Shane has helped shape the university as a member of it's Founding Class and is currently taking a second gap year working for the university's academic team. 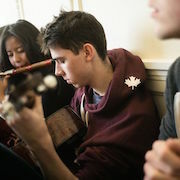 Previously Shane was a Studio [Y] Fellow at the MaRS Discovery District during his first gap year spent in Toronto. Shane is passionate about interdisciplinary learning and has keen interests in education systems, music, and STEM. In his free time Shane enjoys taking canoe trips back home in Ontario, getting lost on Wikipedia, and playing pick-up basketball. Project Abstract: Growth Dynamics of Musical Genres: Who creates? Who benefits? Music critics and fans fiercely argue what songs, albums, artists, and even genres have had the most influence on the evolution of music, however these arguments are generally anecdotal and largely lack quantitative evidence. Our goal is to explore different frameworks for understanding musical influence and evolution by using analogies from related ecological phenomena and mainly looking at genre growth dynamics over the past century. Bio: I'm Xavier Gutierrez, a junior physics major from Maryland. In my free time I'm most likely reading another article on the internet; my favorite things to be busy with are reading actual books, hiking, exploring new places. I like math and science because making predictions about the incomprehensible increases the tools at our disposal as a human society. Project Abstract: It’s the Internet, stupid: Latent Knowledge in Online Political Communities - The quantification of political ideology has traditionally been constrained to a one-dimensional continuum ranging from liberal to conservative, with network analyses accordingly restricted to the view that nodes exhibit one of two states. Using an LDA topic model trained on the Stanford Encyclopedia of Philosophy, I begin the inquiry of localizing individuals in a high-dimensional space defined by concepts. Measuring similarity between topic distributions of documents allows one to hierarchically cluster individual corpora of documents as well as map documents from one corpus onto a conceptual space defined by the other corpus. Such an analysis is performed with users of the r/politics community of social media site Reddit, producing an aggregate philosophical profile of communities of similarly-oriented users. Concluding remarks frame these methods in the context of Gärdenfors' cognitive theory of conceptual spaces as well as properties of statistical metric spaces. Bio: Bradi is a third year student at Indiana University (Bloomington, IN) majoring in cognitive science and political science. In the past her research has largely been focused on the concepts of identity and group status, examining factors of race, gender, cooperation, and competition as they apply to such domains as video gaming, belongingness in STEM fields, media violence, and moral conviction. Besides a heart-fluttering adoration for science and questions of human behavior, Bradi also holds a deep-seated appreciation for street art, poetry, riveting conversation, documentary & book recommendations, Appalachian music, backpacking, and creatively-potted plants. 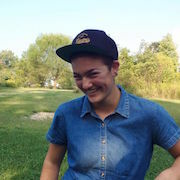 Bio: Jenny is a junior at Indiana University studying Mathematics, Environmental Anthropology, and Creative Writing. 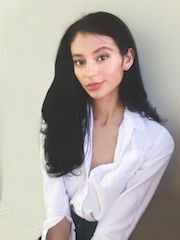 Currently, she is conducting research on the evolution of 20th-century poetry and writing a collection of short fiction on migration and identity. Outside of her studies, Jenny works for IU's Office of the President and teaches/leads climbing trips through IU Outdoor Adventures. Jenny is captivated by cultural studies, language and literature, music (especially cello), climbing/backpacking/hiking, and her dog. How do elite members of a population, or exemplars of a body of work, drive cultural change? What factors predict elevated status in the first place? We investigate the relationship between prestige and cultural evolution in the context of Poetry Magazine, one of the leading English-language poetry journals of the past century. We map approximately 26,000 poems published throughout the magazine’s century-long existence into a poetic space whose dimensions represent various syntactic, prosodic, and LDA-determined semantic features, tracking each poem's canonicity from appearances in the widely-taught Norton Anthology of Modern and Contemporary Poetry. We then assign vector-representations of these poems to Gaussian mixture model clusters that represent endogenously-determined "poetic styles," and we construct directed networks of 20th-century stylistic inheritance and descent. Network analysis shows that poems that receive eventual canonization are at the same time more innovative, having fewer and more atypical combinations of network parents, and more influential, having more network descendants, than their non-canonized peers. This result suggests that, despite Poetry Magazine's commitment to discovering and amplifying a multiplicity of poetic voices, ultimately, a very narrow and prestigious subset of published poets disproportionately shape the trajectory of English-language poetry. 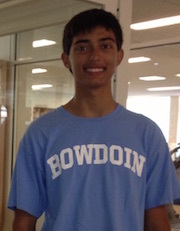 Bio: I'm in the class of 2017 at Bowdoin College, and am majoring in math. 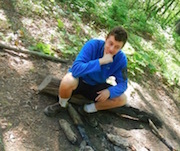 In my free time I love playing ultimate frisbee and going on expeditions in the outdoors. I'm really looking forward to the summer in Santa Fe! Bio: Genevieve is a senior at Barrett, the Honors College at Arizona State University. She is studying Psychology, Biology, and Creative Writing. Her research interests, rooted in developmental psychology, include multiple intelligences, creative learning & STEM, and the butterfly effect of the social context of cognitive development and education. She enjoys the outdoors, hiking, riding horses with her mom in Arizona, photography, piano, yoga, and especially loves animals. Bio: My name is Nayely Velez-Cruz and I am currently a senior at Barrett, the Honors College at Arizona State University. I am triple-majoring in sociology, anthropology, and history as well as pursuing minors in biology and sustainability. As such, my research interests are quite interdisciplinary. In my honors thesis, I introduced a complex systems framework for extracting meaningful information from big data and argue that such an approach would enhance big (open) data’s role as a public good. My current research centers on the formation, evolution, and transmission of knowledge in biological and social systems. Project Abstract: Novelty search and multi-objective optimization for an NP-complete problem -In contrast to traditional local search methods that greedily optimize for fitness, which can sometimes be deceptive and misleading, novelty search is an alternative approach that looks for novel behaviors as a means to reach global optimums. We applied this idea to solving hard satisfiability problems. Incorporating multi-objective optimization, our algorithm performed better than the traditional local search algorithm (WalkSAT) in large and difficult instances.